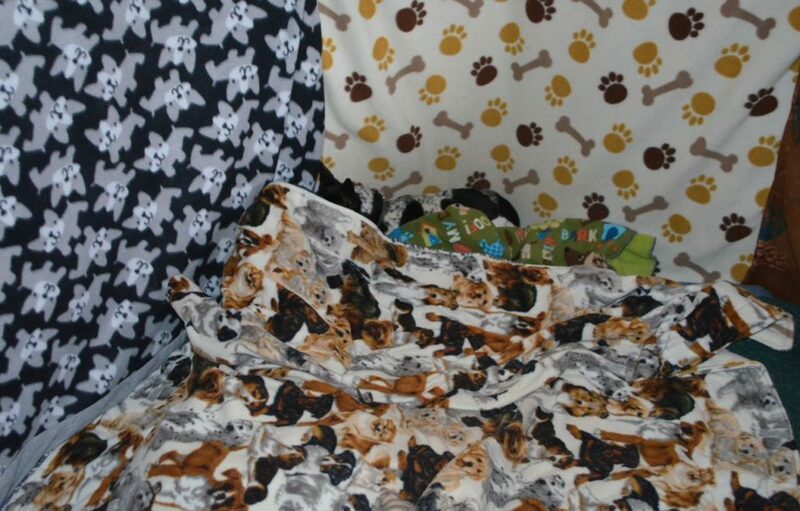 It may be hard to miss at first, but there really is a dog in that collection of canine-themed fleece blankets. This is the “day pen”?in the corner of the living room that is sometimes the “hospital?pen,” and at night?becomes the “bedtime condo” where Tanner sleeps. It’s really just a puppy pen with fleece blankets hanging over the sides, with a 6-inch thick foam bed in the center that is covered in a West Paw bed and then more fleece blankets. The dogs love this spot, and when we let them inside on frosty?mornings after their obligatory potty-stop outside, they make a mad dash for the corner. I took these photos on a recent?late afternoon, so most of the dogs were outside for a?potty break. But I think a certain someone was trying to hide so he wouldn’t have to go out. 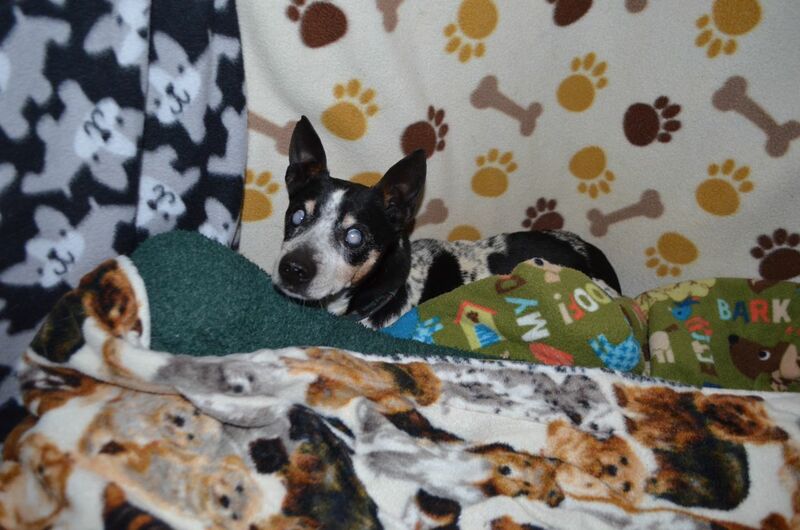 Somehow, even blind, he must have heard about all the dog images on the blankets. Perhaps he thought he might just blend in and disappear? Yes, little blind Taco. He’s doing great, by the way. We had a major health’scare with him a few?months ago, but a liver biopsy sent to a special “liver lab” at Cornell gave?our internal medicine specialist the suspected cause and a treatment plan that worked. His liver tests are now perfectly normal?again. That’s so funny that he manages to tuck himself into the corner. And he was a little hard to spot at first. How big or I should say little is he? He seems to have adjusted well to the group living thing. Glad he’s healthy and doing fine. Hi Taco! Taco is very well camouflaged indeed. Clever pup. Glad to hear he’s doing well. Just received your beautiful newsletter. I especially loved the long article about Esther/Mopsy. The snow cone pictures are great. I’m glad you had a light year in terms of medical expenses, although that number still seems pretty stunning. I can see why it’s so important to make the farm self-sustaining. I am so glad Taco and his liver are doing better. What a great Christmas present! Such a cutie! This shot of Taco reminds me of the closet scene in ET where ET hides among the stuffed animals. Glad he’s doing well !! Looks like the perfect spot to nap or “hide”! He’s so cute! I’m very happy to hear his liver is back to normal. Do you allow visitors to curl up in there with a dog or two? It looks mighty cozy! I’m thinking you could charge for a 1 or 2 hour cuddle and make some mad money!